The long-standing endeavor to systematically catalog the Italian paintings of the National Gallery of Art continues in the publication of this Online Edition. Previous catalogs of the Gallery’s 15th-, 17th-, and 18th-century Italian paintings appeared only as print volumes, while the catalog of the 13th- and 14th-century pictures was published both online and in a limited printing. The remaining catalog in the series, devoted to the 16th-century Italian masters, will be issued only online. The merits of an online catalog are well known; for example, readers may magnify images for close examination and easily compare related works, and texts may be more swiftly updated when scholarship on a work or artist advances. Here, the particular advantage of the online format is that it allows us to publish the 16th-century paintings in discrete groups, without having to wait for the entire catalog to be completed before publication, as would be the case with a paper edition. The decision was made to dedicate the first of these releases to the great triumvirate of Venetian 16th-century painters—Titian, Tintoretto, and Paolo Veronese. The Gallery’s paintings by Titian may not offer an entirely representative selection of his work, being heavy on portraits and mythologies, but they include a number of major pictures and are examined here alongside others previously given to the artist that pose heretofore unresolved questions of authorship, date, and studio practice. The Titian group was cataloged by one of the leading scholars in the field, Peter Humfrey. Incorporating new technical and conservation information, the entries offer in each case the most thorough, carefully considered discussion available of the works in question. They also provide comprehensive bibliographies, exhibition histories, and provenance for each work. The entries on the Gallery’s paintings by Tintoretto or those in his circle, compiled by Robert Echols, similarly combine traditional art historical methods with modern technology. Echols, who has published extensively on the artist, confronted, in this section of the catalog, complicated problems of authorship. Except for altarpieces, Tintoretto is well represented at the Gallery, but his paintings are a mixed group beset with problems of attribution, and it is not always clear whether a given work is by the master or a pupil or follower. 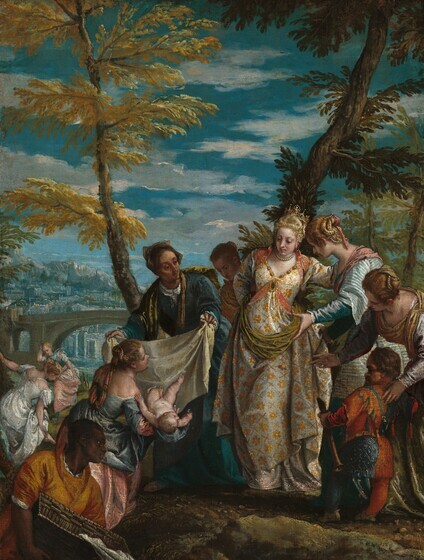 The Gallery’s paintings by or believed to be by Veronese were again cataloged by Peter Humfrey. While the group as a whole does not represent the artist as he may be seen in Venice or in other, more extensive collections of his work, it includes some fine examples, including the little The Finding of Moses or the late The Martyrdom and Last Communion of Saint Lucy. Supplemented by biographies, the catalog entries devoted to Titian, Tintoretto, and Veronese provide convincing assessments of each picture that make this volume essential reading for scholars and students of Italian painting.